Anhui Xinhua Distribution Group Holding Co.,Ltd. 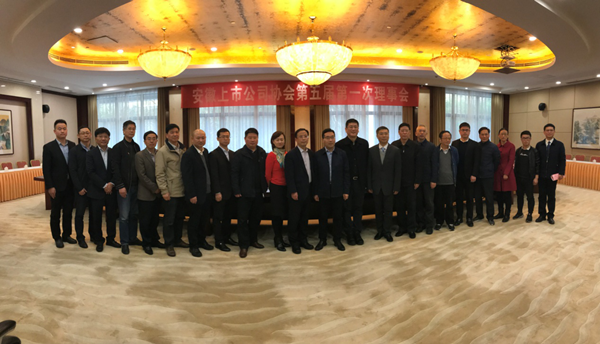 On March 23, 2018,Anhui Association of Listed Companies held its Fifth General Meeting of Members in Hefei.Ye Jinwei, director of Anhui Branch of China Securities Regulatory Commission, Zhang Wensheng, deputy director of Anhui Branch of China Securities Regulatory Commission , Kan Jia 'an,deputy director of Anhui Social Organization Management Bureau and other members from 102 listed companies in Anhui province attended the meeting. Yuan Hongsheng, vice president & secretary general of the Association,presided the meeting at which the Fifth Board of Directors was formed and Wanxin Media chairman Caojie was re-elected as the Chairman of the Association.